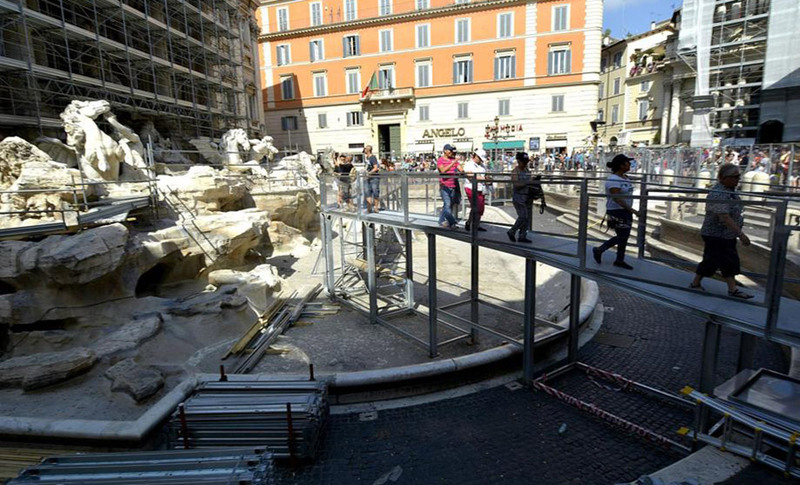 Trevi Fountain long and complex restoration almost completed! More than a year after the beginning of the restoration works, sponsored by the fashion house Fendi, they started to “undress” the Fountain. The final term of the works is planned for the beginning of autumn, probably in October. The facade of the most photographed Italian monument setting for the famous bath of Anita Ekberg in the film “La Dolce Vita”, where hundreds of thousands of people throw coins, is full visible to the tourists. Until now the visitors could peer of the restoration of the place thanks to an especially built “catwalk”, to observe the progress of work. The suspended walkway is not the only novelty prepared to compensate the tourist for missing the full view. Trevi Fountain restoration works have a dedicated website and an application for smartphones. The special app allow all visitors within 200 meters of the fountain to take selfies that can be posted on a special area of the website and the sender will receives an email with a poster of the Trevi Fountain personalized with his own pictures.